INTRODUCTION , Unfortunately, Canadians (of all ethnic backgrounds) sometimes think that because we are all nice and friendly to each other here, and we treat each other with respect here, that somehow other people around the world will also love Canadians and things will be great for us when we travel. Alan Bell calls this the "deny and repress syndrome" and it can cost us our life unless we become more diligent about our affairs when outside Canada. Wearing a maple leaf flag pin might get you a smile from a taxi driver in New York, but it won't be recognized in some of the places around the world where Canadian companies are launching businesses in high risk and threat environments. Why This UNIT is Important In 2004 and 2005 through to early 2010 we have seen a rapid rise in the number, and intensity, of situations outside Canada where Canadians get in to serious trouble. It is increasingly important that Canadians travelling on international business make serious contingencies and take better precautions in order to conduct their business in a safe way so that no harm comes to them, their equipment and company resources. a student who used this information, and the information from our guest speaker Alan Bell In mid-Feb 2010 student Tushar C. in MGTC44 at University of Toronto (UTSC) emailed to comment on how he used some advice on a recent trip. I recently went to Las Vegas for reading week and took into consideration several concepts taught by yourself and Alan Bell. First and foremost, I ensured to book my hotel room on the first 7 floors to make sure that my hotel room was accessible [by fire ladder truck] in the case of a fire. Upon arrival, I then analyzed my surroundings and remained cognizant of escape routes and stair cases even requesting to have a room beside a staircase. Finally, prior to gambling and taking in the nightlife of Las Vegas I made sure to program important numbers and keep a certain amount of cash in my wallet (in a hidden pocket so that I don't spend it) as a mini contingency plan. I'd like to thank you and Alan Bell for enlightening me with these insights as I felt more comfortable and secure throughout my entire trip. Moving forward, I hope to continue to implement all of the aforementioned precautions to increase my sense of security when travelling abroad. thanks for the email, and thanks for the feedback, i keep saying, a big part of being successful in life is just taking simple precautions to either avoid a bad situation, or if a bad situation develops, you will have a better chance of survival cause you had some contingencies. ...good luck in your future world travels. 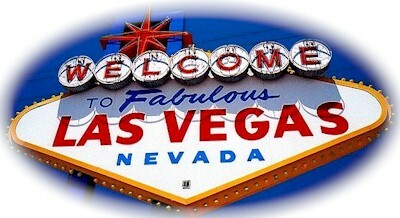 ... BTW, did you get much reading done in Vegas ?? preventive measures There are some preventive measures that can be taken to reduce the effect of threat and risk. One of the most obvious preventive measure is to tell your own government where you are so if there is a disaster, people can contact you, or get help for you. 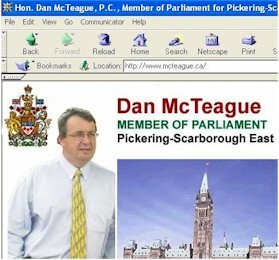 Dan McTeague, a hard working MP from the very multi-cultural riding of Pickering-Ajax-Uxbridge, (and friend for many years of Prof. Tim Richardson) serves as Parliamentary Secretary to the Minister of Foreign Affairs with special emphasis on Canadians Abroad. McTeague recommends registering with the Embassy or local Consulate. Registering means going to the Embassy, or Consulate and filling out a card listing your next of kin to be in contact if something bad happens to you and you are not in a position to make contact to relatives in Canada yourself. 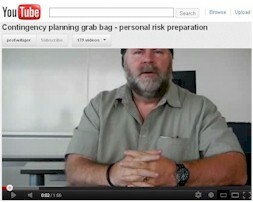 McTeague also explains that you can register online simply by going to www.voyage.gc.ca . 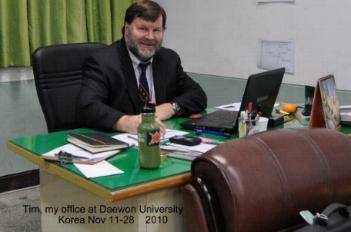 "While the responsibility to help Canadians is one your government takes seriously, the traveller too must take certain measures to assess risk and carefully plan ahead.... Consulate help works, but it is up to individual travellers to make themselves count in the first place"
So, it is November 2010, and sitting in my office at Daewon University in South Korea where I have been teaching a special series of lectures on e-commerce for a couple of weeks. 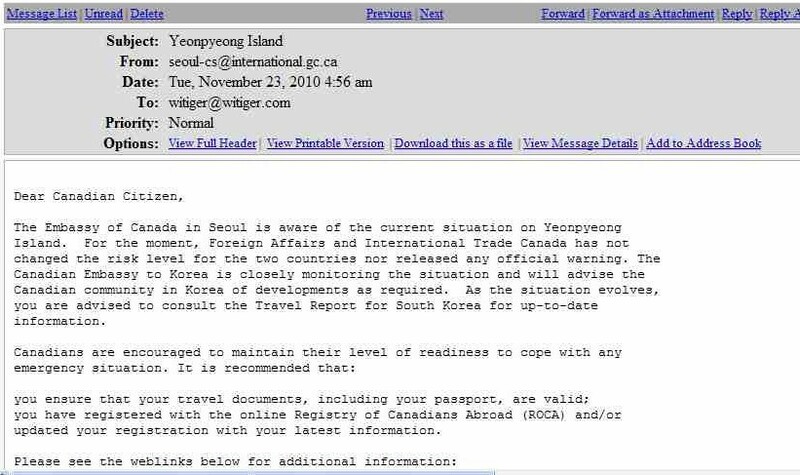 And I get an email from the Canadian Embassy in Seoul - why? - cause in the days before I came here, I registered online with the Dept. of Foreign Affairs website so that I could be advised of any "incidents", and, if something happened to me, the Canadian government would be able to tell me wife and children where the heck I am/was. 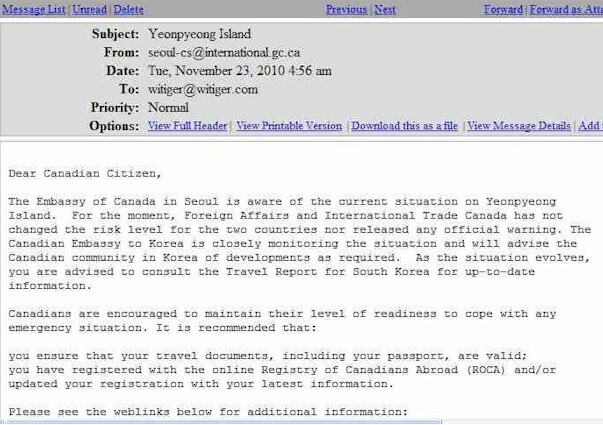 Here is the email sent to all Canadians registered as being in Korea, at the time of the "Yeongpyeong Incident"
What happened at Yeongpyeong in late Nov 2010 was that the North Koreans attacked South Korea killing a number of people - this follows a previous action where North Korean sunk a South Korean navy ship. Example: voyage.gc.ca reported "...October 29, 2005, a series of explosions took place in popular markets in New Delhi (Paharganj, Sarojini Nagar, and Govindpuri). Security has been heightened across the city and countrywide. A "red alert" has been declared in Delhi, Mumbai, Kolkata, and Chennai. Markets have been closed, and citizens have been told to stay at home." "Canadians in the region should exercise caution and maintain a high level of personal security awareness at all times and in all places. ...Canadians seeking emergency consular assistance in the area should contact the Canadian High Commission in New Delhi, or the Emergency Operations Centre in Ottawa, collect at (613) 996-8885." "Canadians with good reason to believe that Canadian relatives are in the affected areas may contact the Emergency Operations Centre at 1 800 387-3124; (613) 943-1055 in Ottawa; or by e-mail at sos@international.gc.ca." 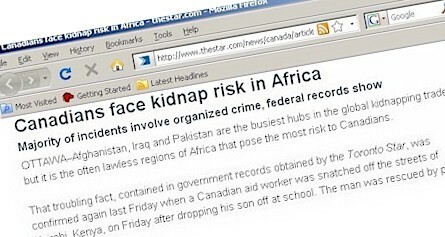 If you get in trouble and need to go somewhere REALLY QUICK contingency planning for personal risk situations - "grab bag"
Toronto Star 2010 Feb 22nd featured a story summarizing some of the current and recent kidnapping situations in Africa. The story explained that "Afghanistan, Iraq and Pakistan are the busiest hubs in the global kidnapping trade, but it is the often lawless regions of Africa that pose the most risk to Canadians....In the first 10 months of 2009, Foreign Affairs responded to eight cases where Canadians had been kidnapped abroad,...Five of those cases were in African countries – Djibouti, Ghana, Sudan and two in Nigeria." - held prisoner in a jail in a remote part of northern India Paul Workman, South Asia Bureau Chief for CTV news and Christian Cotroneo of the Globe and Mail have written stories in January and February 2008 about Canadian Saul Itzhayek who has been held prisoner in a jail in the city of Motiharia in the state of Bihar, which has the distinction as India's poorest, most backward, and most lawless. The story that Itzhayek tells to the Canadian media is that he was in Nepal on a business trip "...and sent a driver into India to pick up a money transfer. The Indian police stopped the driver at the border, and in turn asked Itzhayek to come into India and explain what was going on. He knew he didn't have a valid visa, but says the police offered him safe passage. When he arrived in the country, he was questioned and then charged with "violating India's sovereignty." Journalist Paul Workman explains "In a sworn statement, Itzhayek says the police demanded a bribe. He offered them 50,000 rupees, which is about $1,200, but says they wanted 500,000 rupees, and wouldn't give him time to raise the money." The Indian police then put him in jail. Apparently the Canadian High Commission in India is not able to affect his release [as of Feb 2008]. When the Canadian High Commissioner was challenged that this is a simple case of corruption, he was quoted as saying "There is in India a degree of corruption that is widely publicized here, the government itself discusses it. Whether that's at play in this case or not, and how, I simply don't know"